Prime Minister Nguyen Tan Dung accepted the proposal of the Shipbuilding Industry Corporation (SBIC) to sell 70 per cent of Damen Song Cam Shipyard to the Netherlands’ Damen Shipyards Group. The Ministry of Transport also asked to sell the stake of Damen-Song Cam Shipyard under direct negotiation. SBIC had chosen Damen as the strategic investor under the Song Cam Shipbuilding restructuring plan. 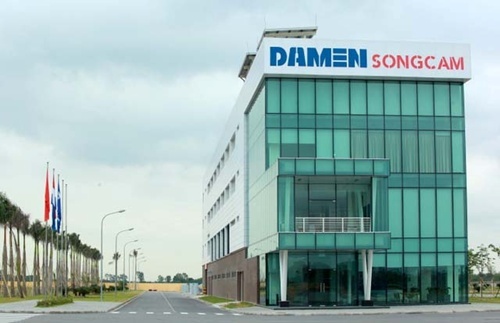 The Dutch group’s attempt to buy a 70 per cent stake in Damen Song Cam Shipyard in Thuy Nguyen District, Hai Phong City had been rejected in 2014 due to local stock market regulations that limited foreign investors to 49 per cent of stock in the company, said SBIC. At that time, the Ministry of Transport (MoT) suggested that they would sell the stake in two packages of 49 per cent first and 21 per cent in the future, but Damen Group did not want to separate the deal. Since then, Decree No 60, which was issued to guide securities law, removed limits for foreign investors in some sectors, said MoT. SBIC was in the process of expanding to the international market and restoring its position from foreign investors after restructuring from the collapsed Viet Nam Shipbuilding Corporation or Vinashin, therefore, the purchase of shares by Damen Group in the Song Cam project was crucial for development. It also helped create the original basis for the co-operation between Damen with other companies in SBIC, said the ministry. According to SBIC, the co-operation with Damen, one of the leading shipyards in the world, would allow SBIC to benefit from their technology and intelligence, enhance its skilled workers as well as increase the capacity of management and competitiveness. Song Cam Shipyard has been the most profitable unit of Viet Nam Shipbuilding Corporation or Vinashin. It was also one of the most effective companies among 8 subsidiaries in SBIC. Song Cam Shipyard reported no losses in the last five years, instead, it secured co-operation contracts with high technical value with Damen. In early 2014, a $60 million Damen – Song Cam Shipyard was inaugurated with 70 per cent of the capital coming from Damen. Damen Group is an international partner which is familar with the local shipbuilding industry. The Dutch company began its co-operation with Vinashin, which was restructured as the SBIC, more than 10 years ago. Damen group also planned to acquire a 49 per cent stake in the Ha Long Shipbuilding Limited Company, a corporate member of the SBIC when the company launches its initial public offering. 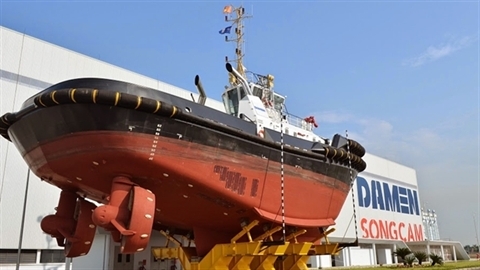 Damen Song Cam Shipyard has the capacity to produce up to 50 hulls and outfit a further 80 vessels per year.